We share glorious credential for manufacturing, exporting and supplying of Petals Neem Arnica Herbal Shampoo in Rajasthan, India. Enriched with Ayurvedic ingredients, our Petals Neem Arnica Herbal Shampoo is beneficial for all hair problems. Offered at the best market prices, our Petals Neem & Arnica Ayurvedic Herbal Shampoo treats split ends and premature graying of hairs. A holistic hair care therapy that balances & strengthen hair nourishment. Rejuvenates your scalp and stimulates the hair follicles, helps to strengthen your hair & prevents from premature falling. 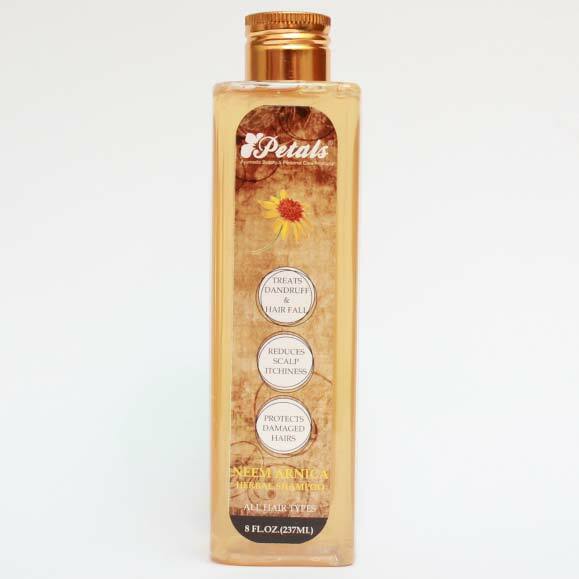 Cleanses the excessive oil and sebum from the scalp, providing it a natural shine. By removing dirt and oil from the scalp, it also helps to fight with dandruff and itchiness, helping in preventing tangled and rough hair. Directions: - Wet hairs; take shampoo as per the hair length. Massage all over scalp & entire hair length, rinse off.